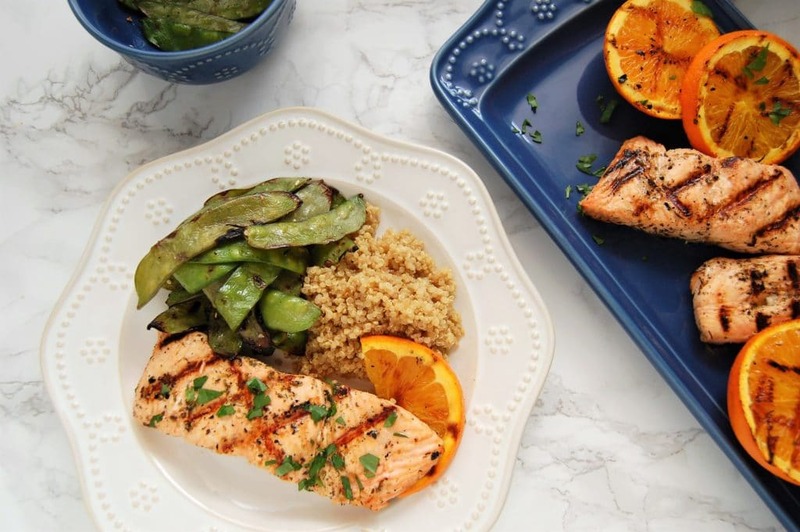 Grilled salmon is made easy and flavorful with a simple four-ingredient orange herb marinade (you probably have the ingredients in your kitchen already!). I love to encourage my clients to experiment and get playful with their food. Have fun with it! Try new foods or try preparing foods in different ways! Maybe you don’t love the raw onions in your salad, but grilled with fajitas is a total game-changer! 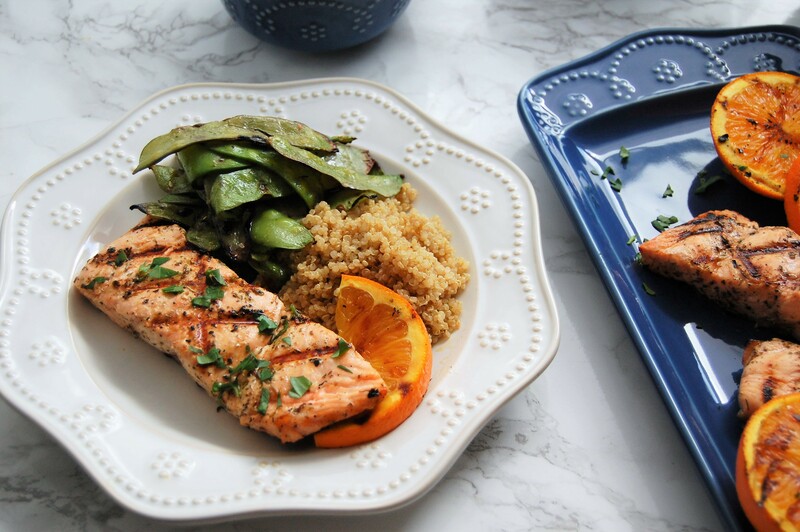 Grilled salmon is one of those things that I always have enjoyed it while out at a restaurant and I adore cooking salmon in the skillet, I had one disastrous grilling attempt years ago (envision salmon totally falling apart all over the grill and through the grates), and have since foregone grilling salmon at home. Well, I’m not sure why I waited so long to try it again. 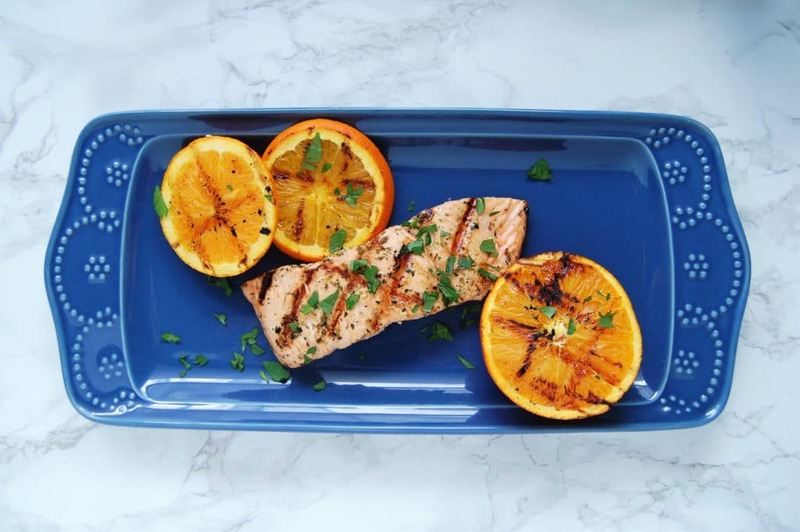 This grilled salmon with a four ingredient orange herb marinade could not be any easier! And I don’t know if you can tell by the photos, but this grilled salmon turned out awesome. The key is not to have the heat turned too high. This time I kept the grill at more of a medium heat, between 350-400 degrees. I left the salmon on one side for 3-4 minutes, then used a grill spatula to gently turn it over for another 3-4 minutes. (In my experience, when the protein is ready to be turned it will come off the grates for more easily.) It couldn’t get easier! The other thing that couldn’t get any easier with this grilled salmon is the orange herb marinade. It’s just four ingredients that most of you probably have in your house right now! Marinate for 1-2 hours, then it’s grill time! If you try this recipe, or any other Nutrition to Fit recipes, let me know what you think! Leave a comment below or snap a pic and share it to social, tagging #nutritiontofit and @nutritiontofit. And of course, if you want to feel your best and find nutrition to fit your own life, contact me about my virtual health coaching services (yes, virtual = all online, and I totally don’t care if you show up to a video call in yoga pants or pajama bottoms)! Combine marinade ingredients (orange juice, olive oil, Italian seasoning, salt). 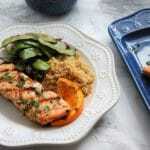 Place salmon in a resealable bag or airtight container. Pour marinade over salmon. Allow to marinate at least 1-2 hours. 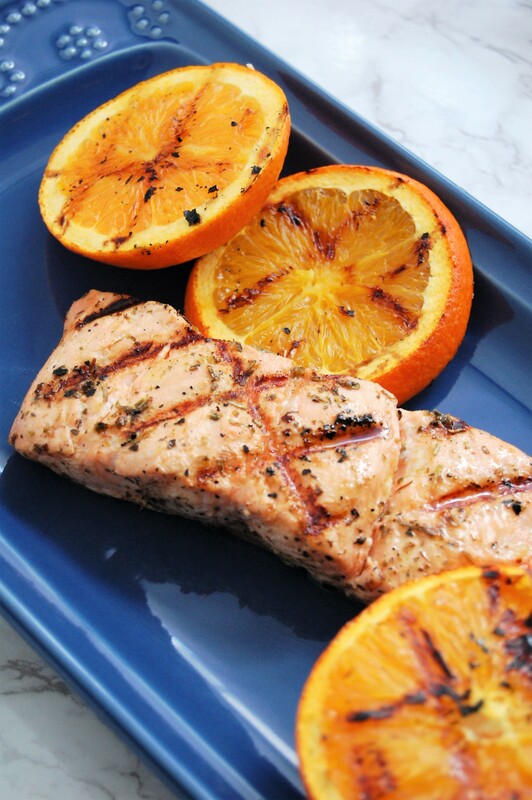 Place salmon on grill and grill 3-4 minutes per side (or until fish is opaque and flakes easily). Discard remaining marinade. For garnish: sprinkle chopped parsley on top, or serve with orange wedges or slices (can grill oranges for extra flavor). This looks so good! I am always looking for new ways to make salmon. We don’t have a grill right now so I am hoping I don’t burn it too much making it in the oven! i don’t have a grill either….and i was thinking same thing…cooking at fairly hi heat over the burner in non stick skillet……it’s just me and my niece that would like this so would cut recipe in 1/2 . Hi Evie! That should work fine! I cook salmon in a nonstick and in a cast iron skillet with a little avocado or coconut oil all the time! Hope you and your niece enjoy it!